The most accurate way to take an infant’s temperature—a rectal thermometer—is also one of the most unpleasant. 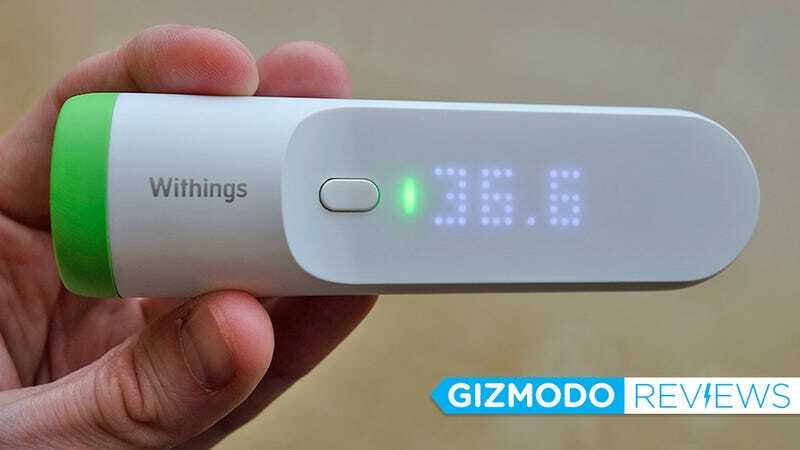 But infants the world over will wail a sigh of relief now that Withings new Thermo, which requires just a forehead sweep to detect a fever, is finally available. First revealed at CES 2016 back in January, Withings, who was recently acquired by Nokia, has finally received FDA clearance for the Thermo, which is now classified as a Class IIa medical device. In layman’s terms, that means the Thermo is both safe to use, but also reliably accurate at measuring a user’s temperature, at least as far as the Food and Drug Administration is concerned. It’s a selling point, first and foremost, but also a little bit of extra peace of mind for helicopter parents. Stare deep into the abyss, and 16 infrared sensors are staring right back at you. So what sets the Thermo apart from your standard drug store thermometer that you stick under someone’s tongue, armpit, or inside other less pleasant areas? Looking into the business end of the Thermo you’ll find what appears to be a tiny mirror, and behind it is an array of 16 infrared thermometers that can take fast temperature readings without having to make contact with skin. How you use the Thermo is what will make the device most appealing to parents or caregivers who have to deal with small kids who don’t want to remain still for more than just a few seconds. That array of infrared sensors is designed to measure a patient’s temporal artery, which runs up their temple and across their forehead, bringing blood from the heart to the head. As a result, it provides a much less intrusive way to measure someone’s core body temperature. That cool looking display is incredibly easy to read in the middle of the night. To take a reading with the Thermo, all you need to do is press the device’s single button, place the green end of the thermometer against the center of someone’s forehead, and then slowly sweep it straight towards their temple until you feel the Thermo vibrate twice. It only takes about two seconds, and during that time the Thermo’s infrared sensor array takes somewhere around 4,000 measurements, which are then processed using an algorithm that takes other factors into consideration—like the temperature of the room—before delivering a final reading. But unless you’re a doctor, or an anxious parent, you don’t necessarily know if the reading you’re looking at indicates something good or bad. So Thermo takes care of that too. Comes with a side of app, but one you’ll actually want to use. Withings has made a name for itself by upgrading common health products, like bathroom scales, with smart and connected functionality that tracks your data so it’s easier to stay on top of your progress. Are those extra features necessary? That’s certainly debatable, but you’ll definitely want to connect the Thermo to its accompanying iOS or Android app. The app keeps tabs on temperature measurements made with the Thermo, allowing you to go back and see how long a fever’s been raging, or if it appears to be gradually subsiding. It can also keep track of temperature readings for every member of your family, including adults, which is something you’ll want to immediately set up. That simple LED display is hiding basic touchscreen functionality, letting you select which family member is the current user. Why? By knowing the age, height, and weight of a user, the Thermo is able to provide instant feedback on whether or not a temperature reading indicates a fever. After the temperature has been successfully measured, the user can scroll the list of family members on the device that were originally added to the app by simply swiping their finger up or down the edge of the Thermo’s display. Yep, it’s secretly got basic touchscreen functionality. Green means no fever has been detected, yellow and red? You might want to visit your doctor. Once the appropriate user has been selected, a simple green, yellow, or red LED will illuminate next to the temperate reading, indicating if everything is ok, if a fever is starting, or if there’s a “seek immediate medical attention” situation. Hopefully you’ll never see the red. Testing the accuracy of the Thermo is difficult without access to the same medical tools that hospitals rely on to take a patient’s temperature. But from my own testing, the results were incredibly consistent when taking multiple readings, again and again, on various users, and on various parts of the body. (You’ll want to stick to measuring foreheads for an accurate indication of a fever, though.) The device’s FDA approval also means you can rely on it for preliminary temperature readings, just make sure to contact a doctor when the Thermo indicates a problem. Bonus points for the slick magnetic battery cover, and an impressive two years of functionality on a pair of AAAs. Available starting today at Apple’s brick and mortar stores, or from Apple’s and Withings’ online stores for $100, the Thermo is far from a cheaper alternative to a standard thermometer, rectal or otherwise. Especially since you’ll also need to factor in the cost of a smartphone with Wi-Fi or Bluetooth connectivity to take advantage of its most important features. But any parent who’s tried to take the temperature of a sick child will immediately see the value in how incredibly easy the Thermo is to use. Getting a cranky kid to stay still for two seconds for a forehead sweep still isn’t easy, but it’s much better than the alternatives. Incredibly easy to use, even for self-administration, thanks to haptic feedback that lets you know when a reading has been successfully taken, and a color-changing LED that intelligently indicates the presence of a fever. Its simplistic white on white LED display is easy to read in the middle of the night, but also in bright light during the day. Battery life is rated at an impressive two years on just a pair of AAAs, and the easy-to-remove magnetic battery cover is well-designed. No on-device memory or recall means you’re reliant on the Thermo smartphone app to remember previous readings. At $100 it isn’t cheap, particularly when a smartphone is pretty much a required accessory. On the larger side of infant thermometers, but its form factor keeps it easy to carry.